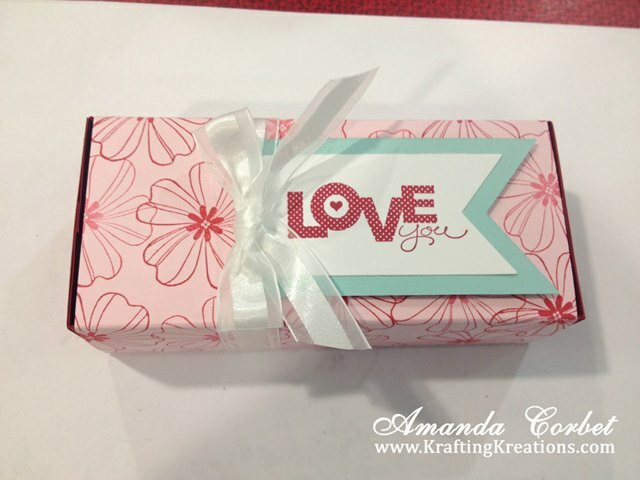 This is a nice little box for an extra special give. I thought it might work nicely to hold a Mother's Day gift of chocolate, or jewelry, or chocolate and jewelry. 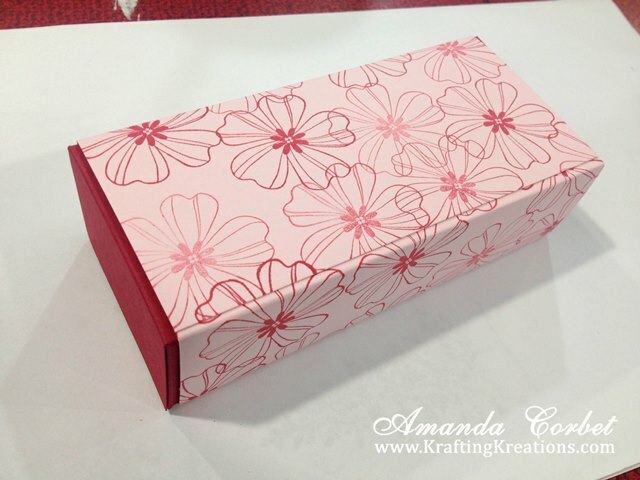 Or anything else that will fit inside 2-1/2" wide x 5-1/2" long x 1-1/2" high box. 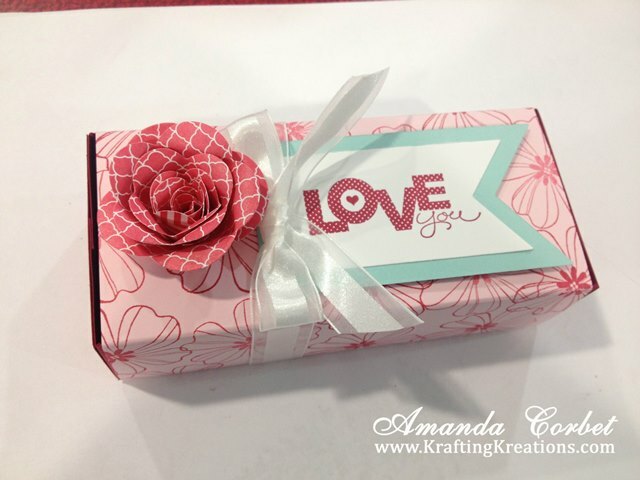 Pink Pirouette card stock 5-1/2" x 8-1/2"
Raspberry Ripple card stock 5-1/2" x 8-1/2"
You will want to have this lovely box making tool. So go ahead, go on over to Connie's blog and watch her video. Then make your own box making shim and come back here. Mmmkay? 1. 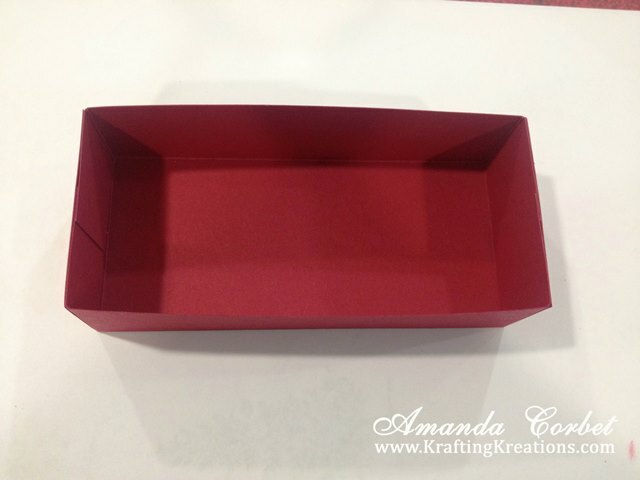 Place your box making shim on your Simply Scored. 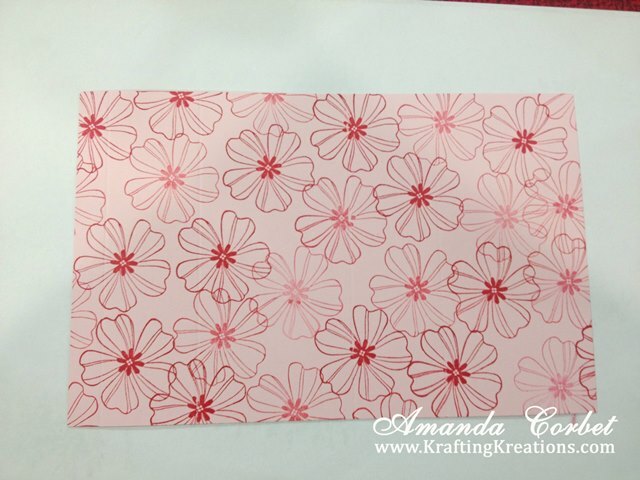 Now place the Raspberry Ripple card stock on your Simply Scored and score at 1-1/2". Rotate the card stock 90 degrees either direction and score at 1-1/2". Repeat two more times until you have all four sides scored. 2. 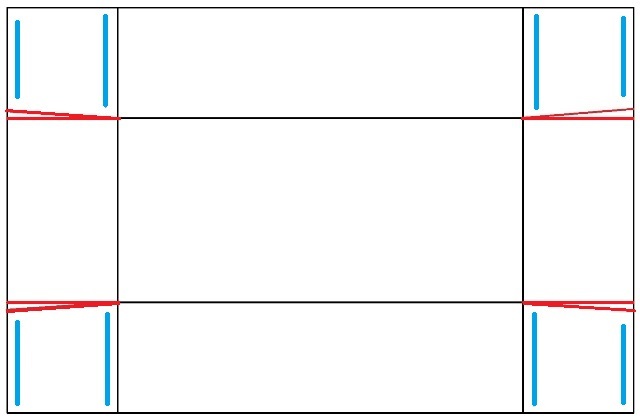 Use Paper Snips to cut in the locations indicated with the red lines. Then apply Sticky Strip in the locations indicated with the blue lines. Fold on all the score lines. 3. Remove the Sticky Strip liner from one of the tabs and adhere it behind the adjoining end flap. Repeat with the three remaining flaps to form the box. 4. 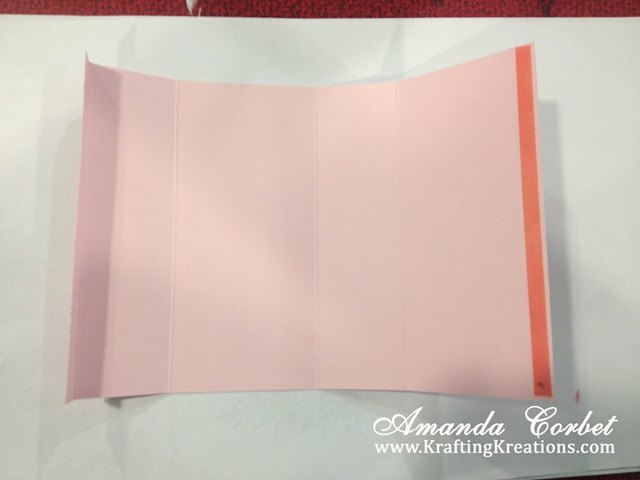 Place your Pink Pirouette card stock on the Simply Scored without the box shim and with the 8-1/2" edge against the top. Then score at 2-1/2", 4", 6-1/2", and 8". 5. 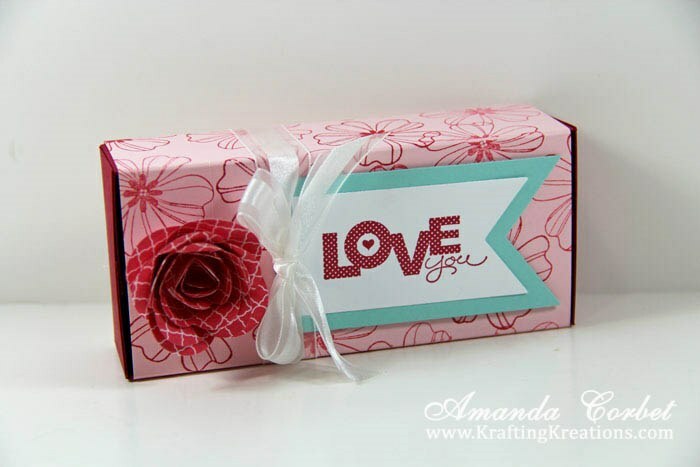 Stamp the card stock with the flower image from Flower Shoppe in Primrose Petals ink. To get the different shades of color on the flower just stamp the image twice before inking up the stamp again. 6. Apply Sticky Strip in the location indicated with the blue line on the stamped side of the card stock. Fold on all the score lines. 6. 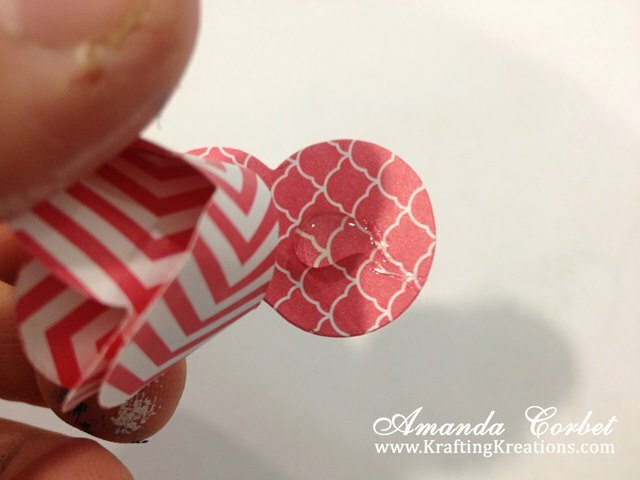 Remove the Sticky Strip liner from the stamped Pink Pirouette card stock. 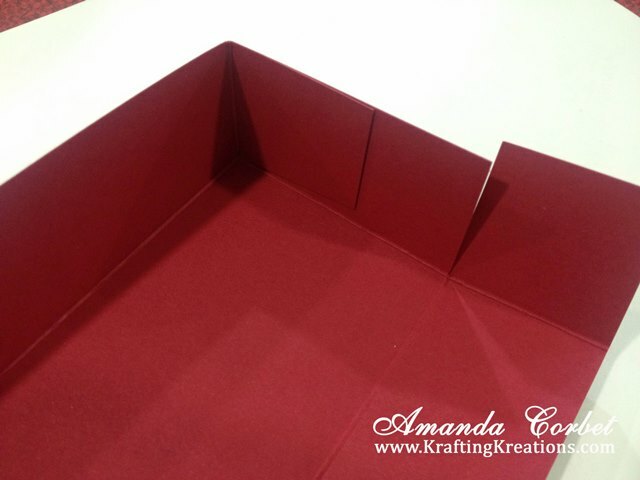 Fold the card stock around your box base and adhere the Sticky Strip onto the narrow flap. 7. 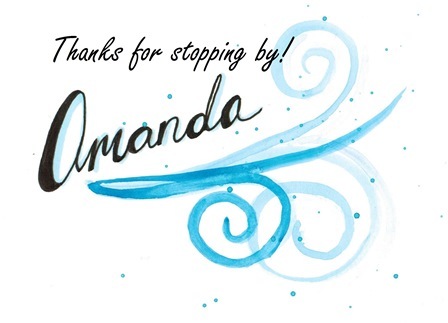 Stamp the greeting from Seasonal Sayings onto a scrap of Whisper White card stock. Cut this out on the Big Shot with the 3rd from smallest Banner Framelit. 8. Use the 4th from smallest Banner Framelit to cut a scrap piece of Pool Party card stock. Use glue stick to glue the banners together. 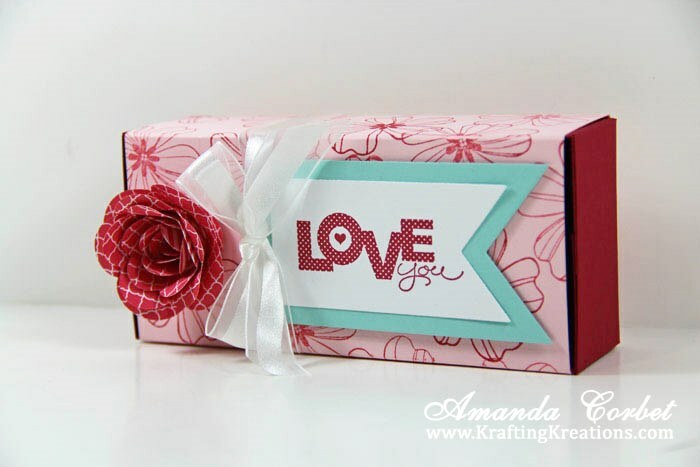 Then stick the banner onto the top of the box with a few Stampin' Dimensionals. 9. Wrap the 20" ribbon around the box and tie it into a bow. 10. Cut two pieces of Strawberry Slush DSP 4-1/2" x 4-1/2". 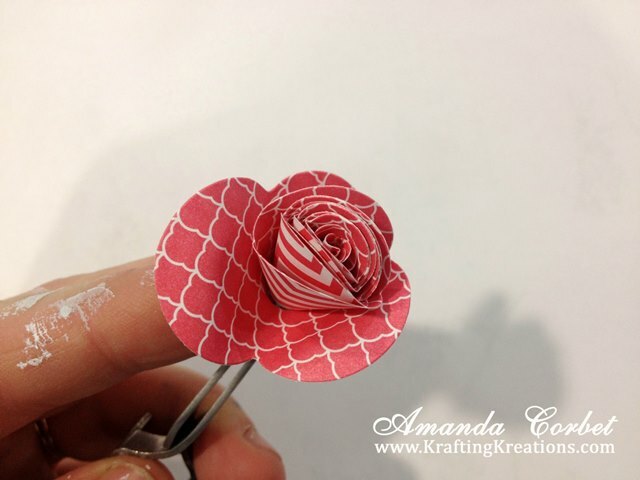 Run both pieces through the Big Shot on the Spiral Flower Die. Take your bone folder and curl the scallops back. Then take one spiral and starting from the outside roll it up into a tight coil. I like to use some crafting tweezers to hold onto the center so it's nice and tight. 11. Once you have the flower all rolled up let go of the center so it springs open a little. 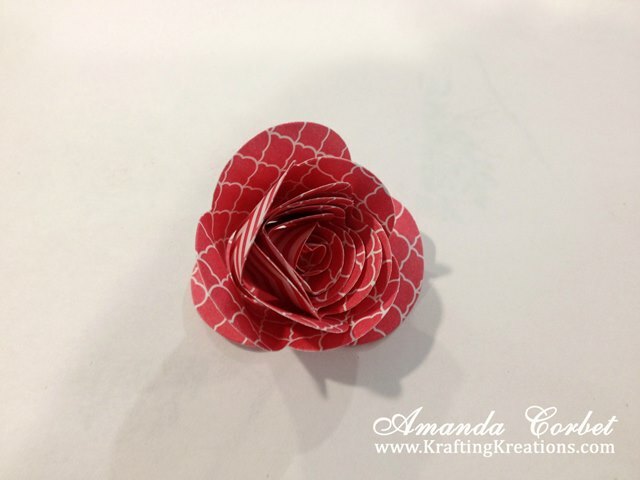 Then add a little hot glue onto the largest scallop and press the flower into the glue. Use your fingers to open the petals up a little more. 12. 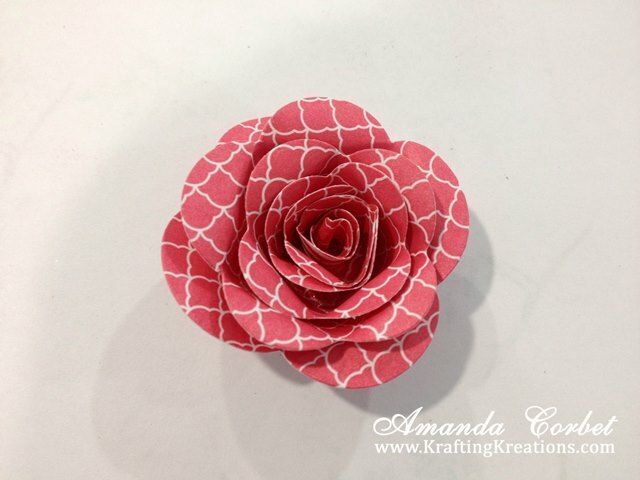 Use a little more hot glue to glue the flower onto the box. Now just fill your box with lots of chocolate or a small gift and it's ready to give! Enjoy!